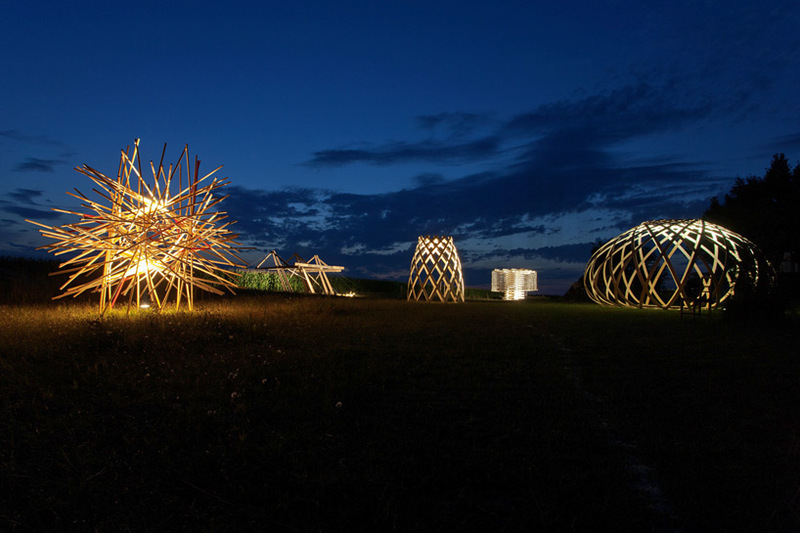 as a continuation of its annual workshop, hello wood has held its 2014 summer camp, resulting in 14 structures conceived and constructed by an international group of designers and students in hungary. 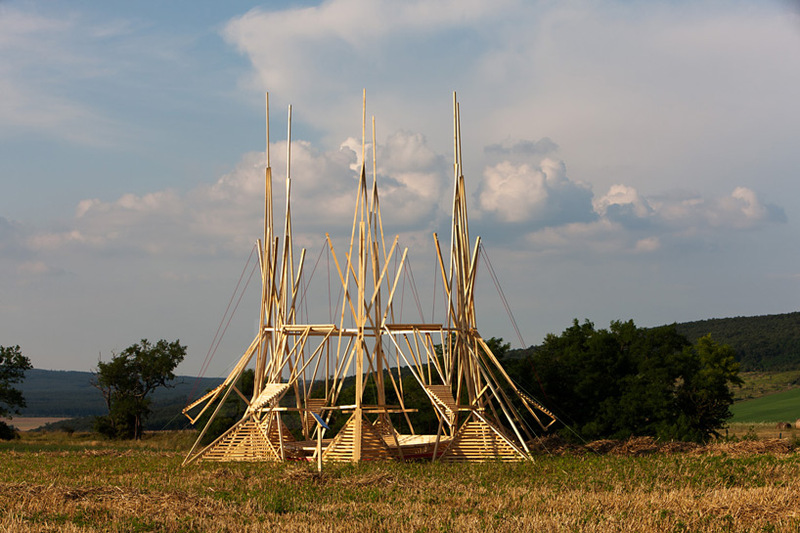 held on the rural site of csórompuszta, near hungary’s lake balaton, this year’s program was based on the theme ‘play with balance’ in an attempt to question stability and equilibrium in architecture. 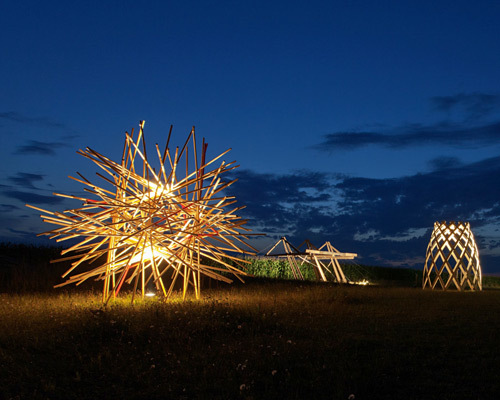 the disparate installations utilize light timber members in a variety of organizations to create different spatial experiences. 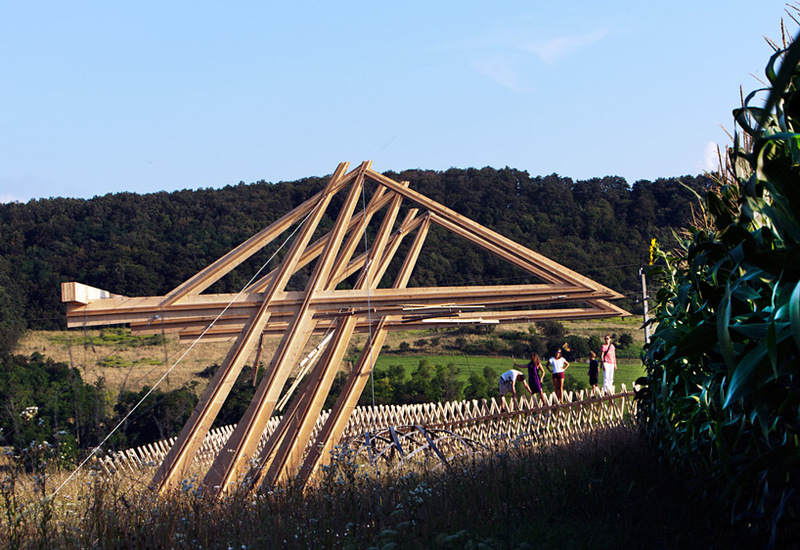 with instruction by dutch artist, one of the student-based groups realized ‘barny’, an open structure made of three frames. the project is influenced by the vernacular architecture, specifically the chimneys and roof forms of the houses. the elevated trusses lean out from their inclined posts, to suggest a covered space in the open field. 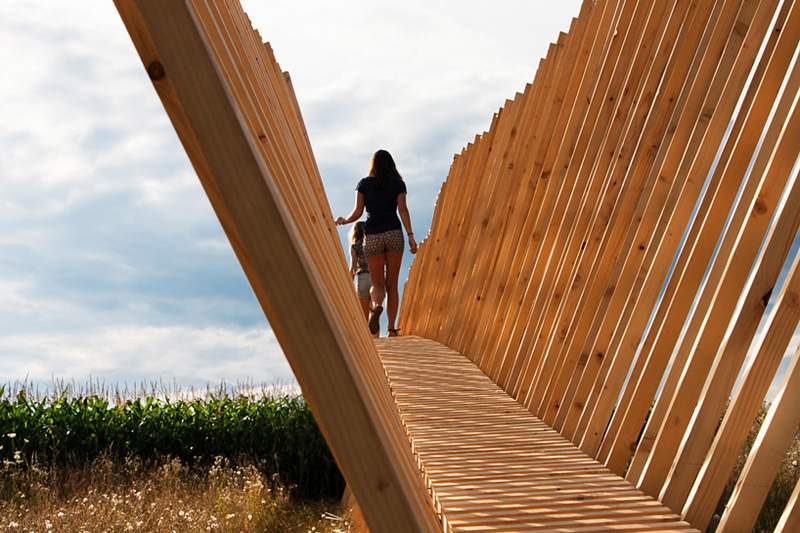 led by hungarian architects juhász ákos + eke dániel, ‘corn-walk’ is an elevated pathway that passes in a direct line from open field into the corn stalks. 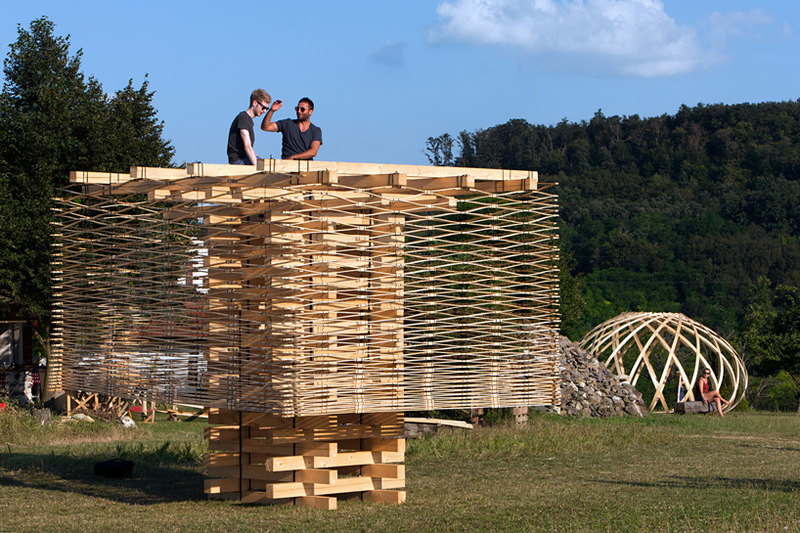 the 40 meter length structure is made of 4×4 members arranged in X-shaped units, and infilled with horizontal pieces to create a ramped floor. 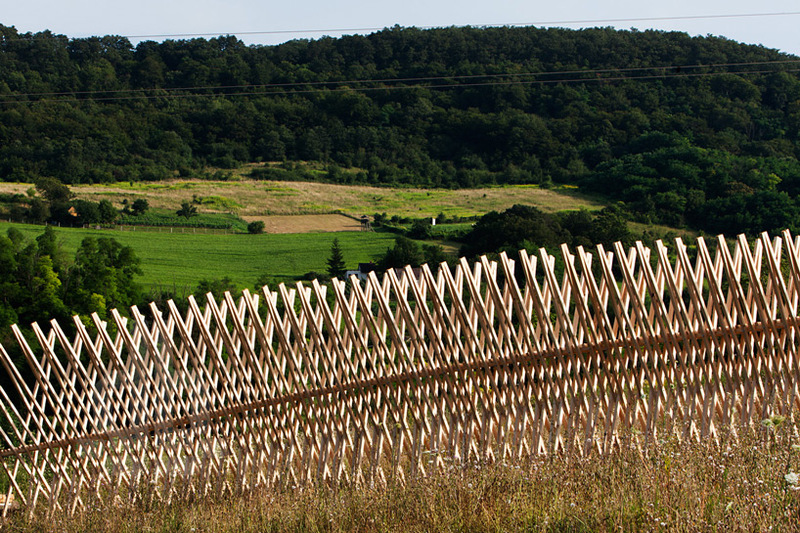 the installation titled ‘forcefields’ occupied a sloping site, and was led by biayna bogosian of the los angeles-based design firm something somewhere. the structure places vertically oriented sticks among holes in the floor panels, resulting in a field of porous partitions. 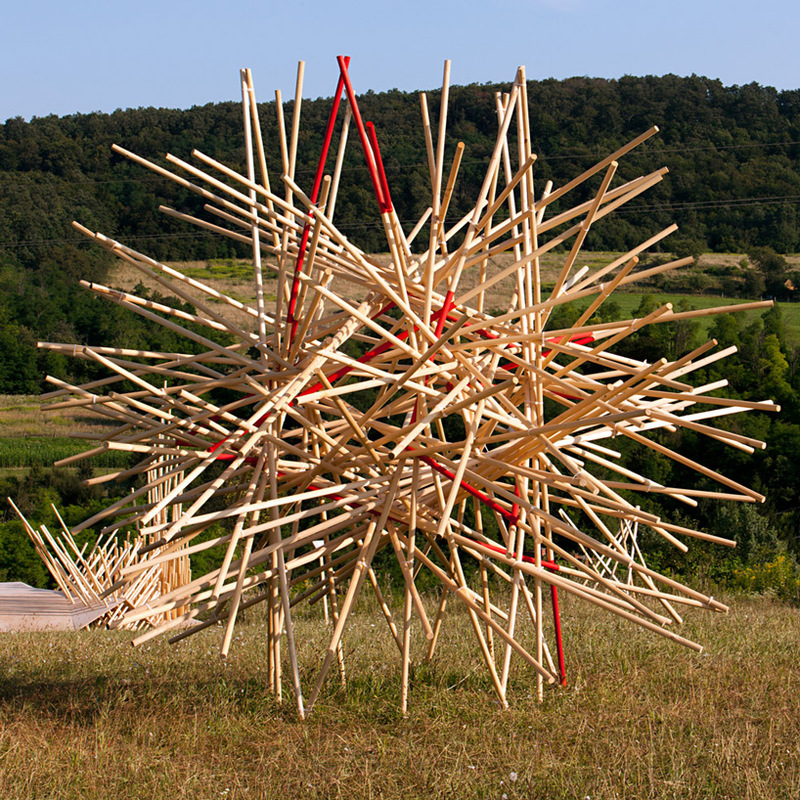 the poles are unfixed in order to be reconfigured based on the topographic conditions and spatial arrangement. 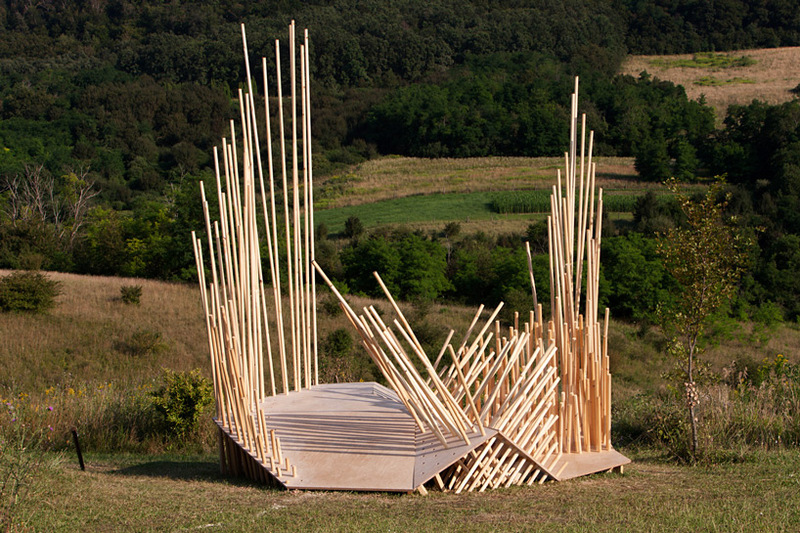 the piece serves as a walkable surface able to seat up to 15 people. 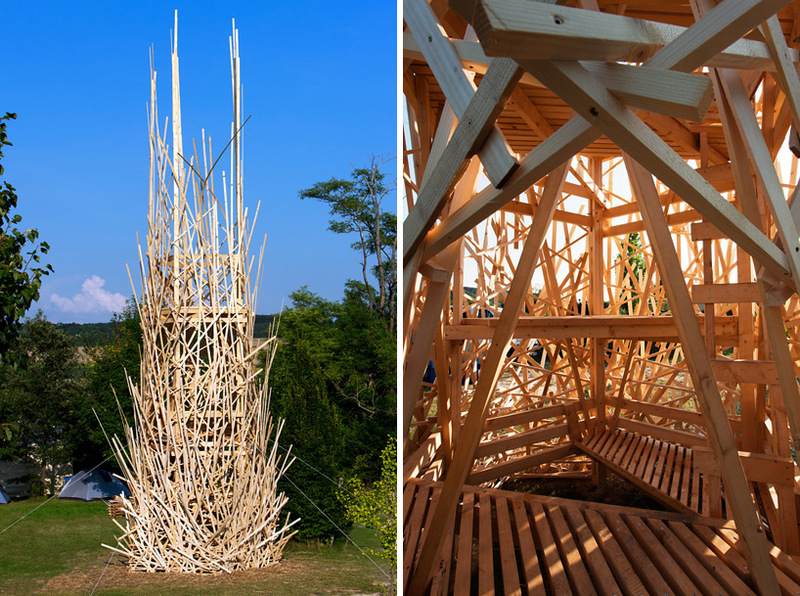 the towering structure ‘spikefort’ was headed up by a british-austrian duo consisting of bence pap and oliver sales. the spire is wrapped in a chaotic arrangement of thin members, which creates a dynamic and non-figurative enclosure. visitors are able to climb through its multiple floor levels, and sit for an elevated view. architects andrás cseh (HU) and jelena pejkovic (SRB) led a team to develop ‘spaceship’, a kinetic structure whose balance is determined by its occupants. 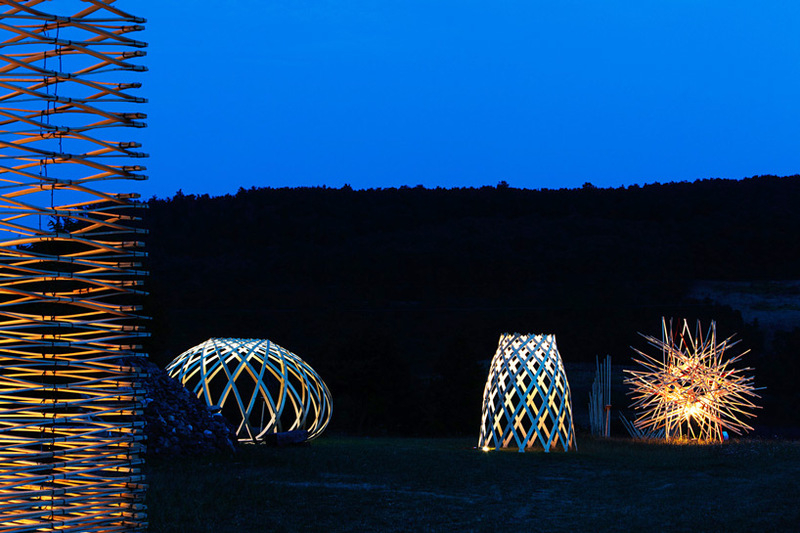 the radially organized folly features a disc-like floor, which is hung from six towering posts. between 2 and 10 people contribute to the installation’s performance, which produces a destabilized and engaged experience. ‘accordion’, with instruction by scandanavian architects elias lindhoff + sebastian mardi, takes its name from the light screen surrounding its central core. the porous cover is shaped by weather forces such as wind and rainwater to create a dynamic spatial envelope. additionally, visitors are able to climb the timber structure for an elevated view.